When people think of Indian restaurants, they tend to conjure up the same image of white tablecloth restaurants with a random Bollywood movie blaring in the background, plates of creamy chicken masala, piles of fluffy naan, and maybe an order or two of samosas if you’re feeling extra adventurous. And while Indian restaurants like this do exist, to only visit them would be to miss out on the hundreds, nay thousands, of dishes the Indian subcontinent has to offer. The following restaurants all stretch way beyond stereotypical expectations of what an Indian restaurant should be offering up instead dishes like dosa, a crepe made from rice and lentils, to Indo-Chinese dishes like spicy stir-fried noodles, to street food favorites known as “chaat.” So grab a cup of chai and check out this list of the 23 best Indian restaurants in the country, below. 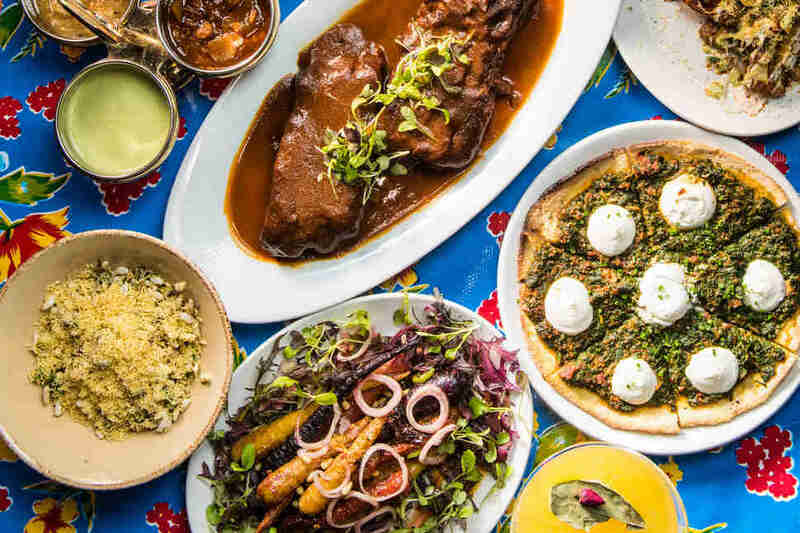 New York City arguably has the most exciting -- and diverse -- restaurant scene in the world. Name a country and you can probably find not only its cuisine, but an exemplary version of it. So, logic would dictate that New York would be a hotspot for Indian food. However, that isn't quite the case. 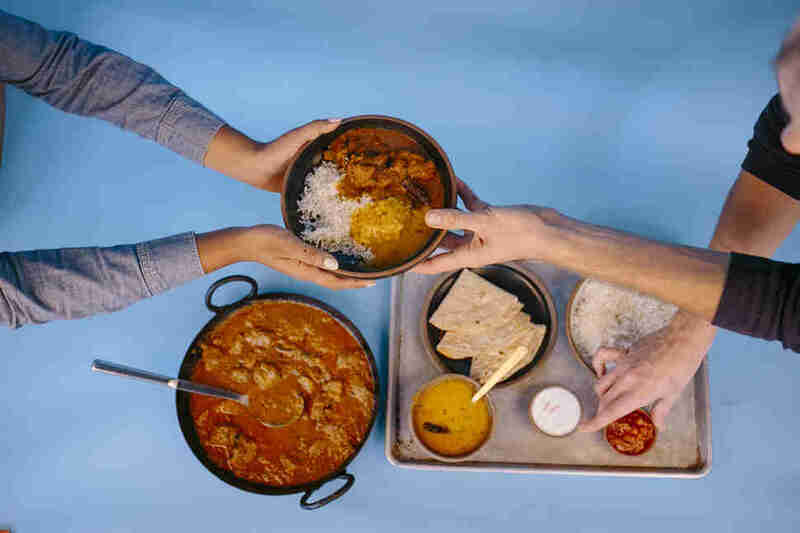 It's a cuisine NYC struggles with -- most of the options limited to fast casual Chipotle-inspired bowls, overwrought and fussy "modern" Indian food, or standard (and blasé) British curry house fare. Then there is Adda. 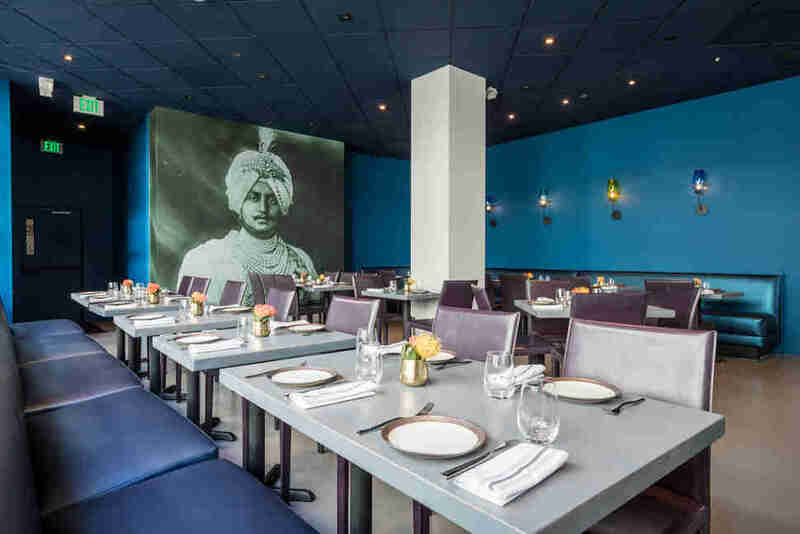 The restaurant, headed by up by chef Chintan Pandya, is located in the somewhat transportation-challenged neighborhood of Long Island City in Queens. What makes it stand out is that Pandya doesn't try too hard. Instead, he focuses on packing flavor (and often a lot of heat) into every single dish, while cooking Indian dishes that don't often bless menus. Offal also makes an appearance on the menu in the form of gingery chicken livers (tawa kaleji) and fiery goat brains (bheja fry). The menu is meaty, and soars where it comes to dishes like goat biryani and tender tandoori poussin. 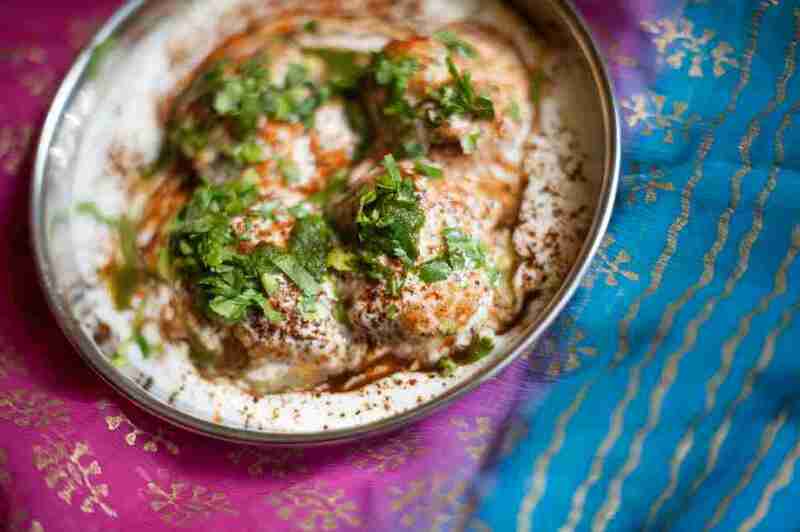 But vegetarians can look forward to dishes like lotus root kofta, which is made with house-made paneer and arrives floating in an impossibly creamy fenugreek and tomato base that you'll want to wipe up with cheese-stuffed naan. This Bay Area restaurant gets its name not from the date it was founded, but the day India declared independence from British rule in 1947. As a result, you won’t exactly find British-Indian favorites like chicken tikka masala and vegetable jalfrezi on the menu. 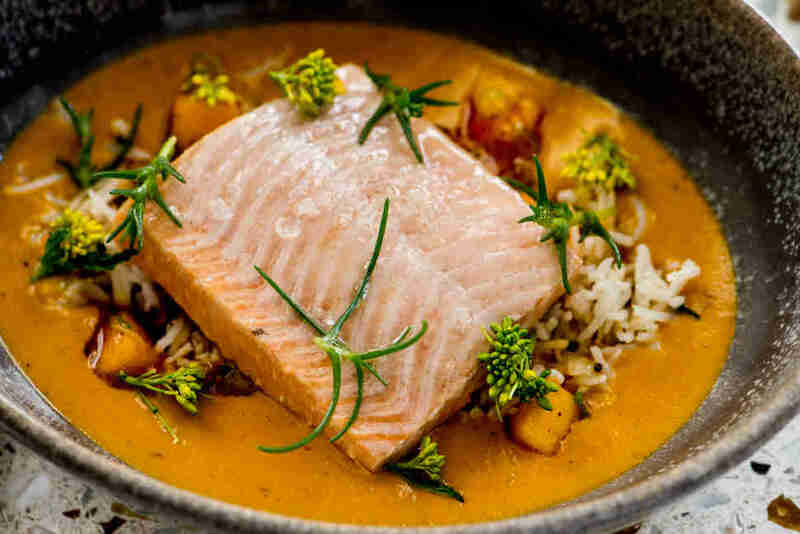 Instead on deck are dishes that don’t mind blending Indian dishes with international ingredients: dinner can include plates like sea bass with a wasabi beurre blanc, while brunch means a play on shrimp and grits, with upma, a spiced porridge made from cream of wheat subbing in for the grits. Badmaash, which means mischievous in Hindi, perfectly encapsulates the restaurants run by brothers Nakul and Arjun Mahendro and their father Pawan. 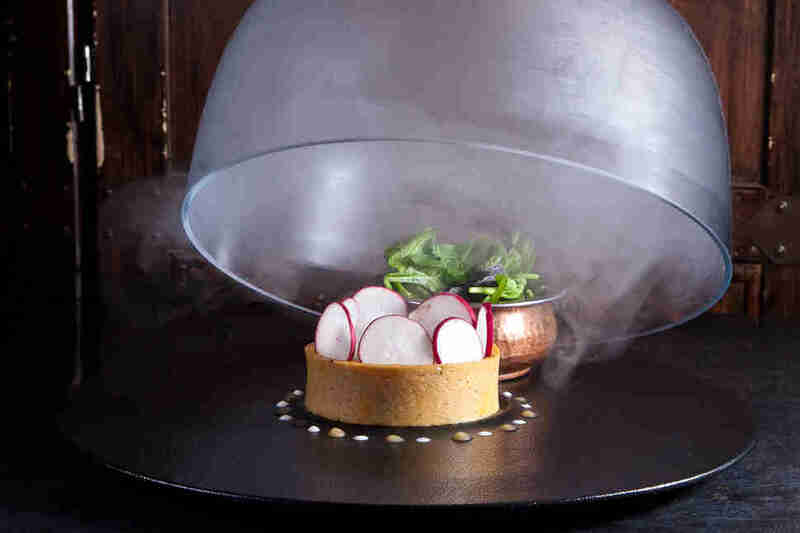 The menu is rebellious, while also honoring traditional dishes by doing them better. The trio stuff perfectly flaky samosas with creamy butter chicken. They also put tandoori chicken tikka over masala fries and douse it with beef gravy and cheese curds making an Indian riff on poutine (a nod to their Canadian heritage). Other dishes you might not expect to find on an Indian menu? The spiced mango pork belly, which is slow cooked in its own juices and fall-off-the-bone braised beef short ribs flavored with turmeric, cumin, and garlic. You might be full, but you cannot skip dessert, which includes a genius ice cream sandwich crafted from Parle-G, a popular Indian cookie. Breaking the rules is clearly working for the Mahendros, who opened a second Los Angeles location of Badmaash this year. Biju’s is Indian fast-casual dining at its finest. 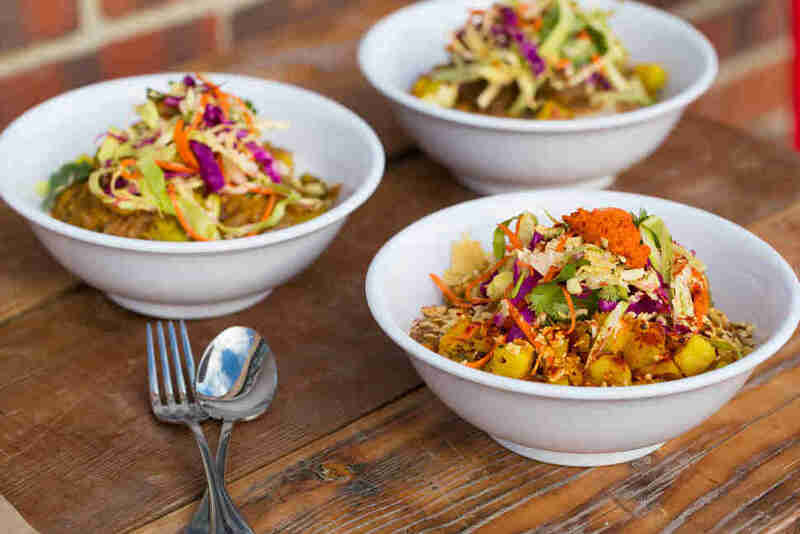 There are no white tablecloths, instead there is a simple, but flavor-packed, menu of South Indian-inspired bowls. 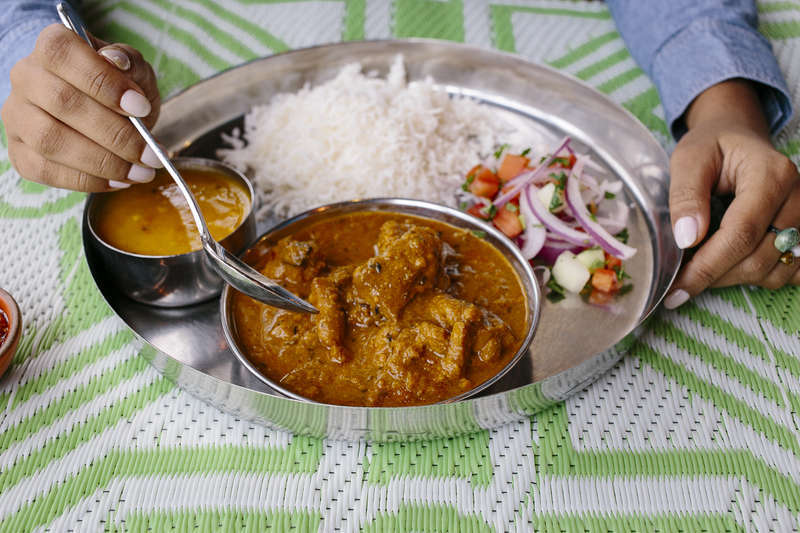 While beef is a rare find on many Indian menus, Biju’s makes an excellent version of masala neef, which is braised with garlic and ginger and served over basmati rice. Heat chasers will be happy with the X-Hot Vindaloo Chicken Bowl. As the name indicates, the dish includes a pile of fluffy rice topped with chicken cooked with ground ginger and well, extra hot, spices (though it comes with an herbed yogurt if things get too hot). Half the fun of Bollywood Theater, one of Portland’s top Indian restaurants, is the space which transports you to India without the spendy plane ticket or 15-hour flight. Chef Troy MacLarty, who fell in love with Indian food after a trip to the country, serves an expansive menu at both locations of his restaurant. Most dishes are inspired by the food culture of Mumbai, so don’t miss the pav bhaji, a dish of mashed-and-spiced vegetables and extremely buttered bread that is ingrained in the fabric of the city. The pro move is to order it with a topping of shredded cheese that gently melts into the vegetables. 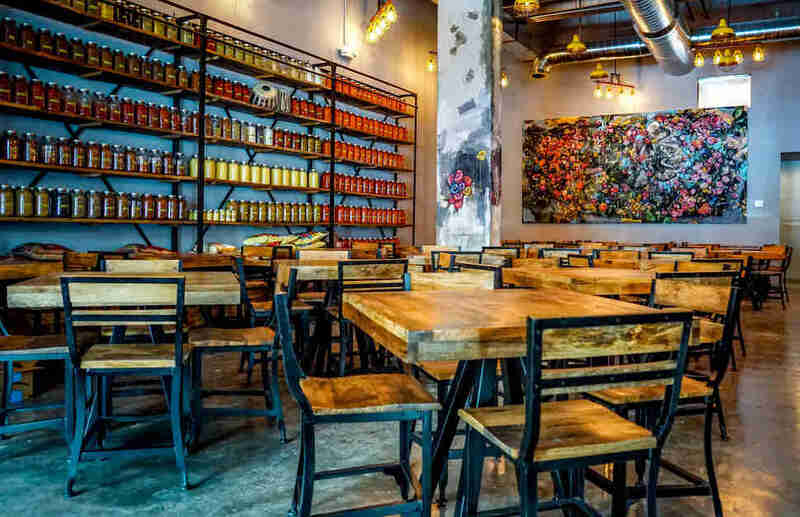 Chef Floyd Cardoz, who you might recognize from Top Chef Masters, recently revamped his SoHo restaurant Paowalla, transforming it into The Bombay Bread Bar. Pretty much everything is good here from the cocktails (don’t skip the Tequila Walla made with calamansi, coriander, and campari) to the small plates like apple & potato chaat (an unexpected combo that works) and the egg Kejriwal toast, a dish made with coconut-chili chutney and plenty of melted Cheddar. The real stars, however, are the breads. You don’t really name a place a bread bar if you don’t have the carbs to back it up. Cardoz does not disappoint offering up everything from an almost quesadilla-like Cheddar cheese naan, to a flaky leek and potato parantha. There’s also a tangy sourdough naan, a herby rosemary naan, and an extremely luxurious laccha parantha (which has almost as many layers as a croissant). Bombay Chopsticks is one of the rare restaurants dedicated solely to the fusion cuisine of Indo-Chinese food. It’s essentially like your favorite Chinese takeout spot, but with the spice and flavor levels amped up about 10 notches. Start with classic Indo-Chinese dishes like a bowl of thick sweet corn soup and vegetable manchurian, a dish of dry-fried vegetable “meatballs” cooked in a pungent sauce of garlic, ginger, soy, and chilis. Then move on to more adventurous dishes like Chicken Dragon Rolls, essentially spring rolls filled with minced chicken, or the Drums of Heaven, chicken wings cooked with dry red chili, ginger, sugar, and green onion. Dessert will likely feel necessary after eating all that heat, and each one at Bombay Chopsticks house comes with a scoop of vanilla ice cream. We’re partial to the saffron cheesecake. Chai Pani, which translates to tea and water, is arguable one of the most famous Indian restaurants in the country. 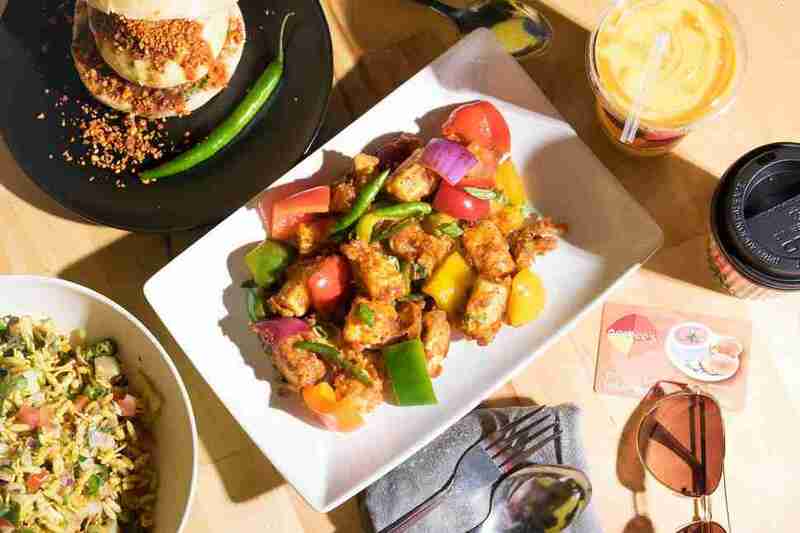 Here, chef Meherwan Irani, who owns a number of restaurants, focuses on the traditions of Indian street food while also being flexible on the rules. Come hungry so you have room to down both a Sloppy Jai, which is spiced halal lamb hash between two griddled buns, and an order of samosa chaat, where two samosas are topped with a chickpea stew and plenty of chutney. (Throw in an order of matchstick okra fries, because why not when in the South.) Come thirsty too, because as the name indicates, Chai Pani makes a very good masala chai. Cumin is the perfect spot for those who want to venture outside of their comfort zone while also loading up on favorites like lush chicken tikka masala and crispy vegetable samosas. That’s because Cumin manages to serve both Indian and Nepalese favorites. So in between bites of lamb biryani and garlic naan, make sure to leave room for steamy chicken momos, the popular (and large) Nepalese dumpling. Another must: the Namche Bazar Ko Sekuwa, a plate of boneless goat meat, cooked in a tandoor oven, and served on a sizzling platter. It’s like fajitas, but meatier. It’s rare that Indian restaurants in America actually come here from India. 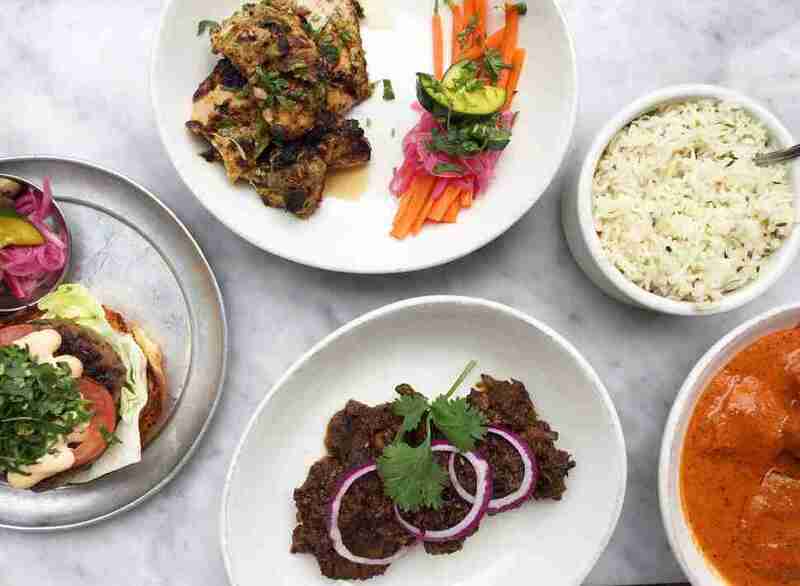 But Indian Accent, which has charmed Delhi for years, finally made its way stateside in 2016, and it’s unlike you’ve ever had Indian food like this before. Keema, a dish typically made of minced meat, arrives to the table with miniature buns for scooping. Except the dish is made with soy crumbles, transformed to taste like ethereal animal protein, shedding its usual flavor of vegan-experiment-gone-wrong. Each dish arrives with incredible structural plating so beautiful it almost makes you forget about the butter kulcha, or flatbread, stuffed with morel mushrooms, smoked bacon, or butter chicken. And then there is dessert: If you go Indian Accent for one dish alone make it the makhan malai, an ethereal mound of velvety whipped cream flavored with saffron and topped with a rose petal brittle. Many people will argue that the best Indian food in America is found in Edison, New Jersey, which is home to one of the largest Indian communities in the United States. They are not wrong. 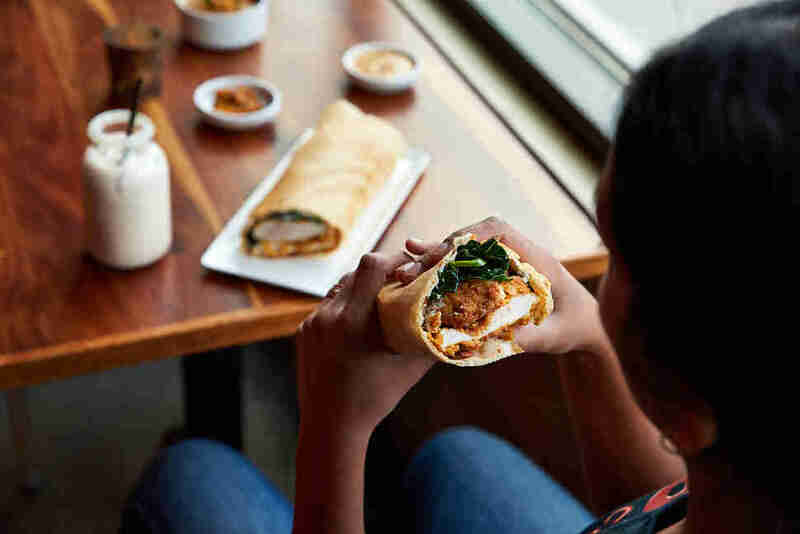 While there’s number of great restaurants to choose from, our favorite is Dimple’s Bombay Talk, which crushes the notion that vegetarian food is “boring.” Not only is there an incredible selection of Indian style sandwiches like the Bombay Veg. Sandwich -- a triple-decker construction made with shredded vegetables, melted cheese, and various chutneys -- but there are also many plates of both Indo-Chinese and Indo-Thai food. These dishes are “fusion” foods at its best: Grab an order of hakka noodles -- essentially spicy lo mein -- or fried tofu that is salted with peanuts, bell peppers, and chili. We promise you won’t miss chicken tikka masala or naan one bit. Dosa by Dosa, is the confusingly named fast-casual offshoot of Dosa, a pair of fine dining Indian restaurants located in SF. Across the bridge, the team serves a more casual menu of salads, including an especially delicious one made from coconut, kale, and mung beans; street wraps, made from a grilled roti stuffed with fillings like prawns cooked in coconut milk and fresh curry leaves; and rice bowls, where homestyle dishes like butternut squash daal are ladled over your choice of rice. (We definitely recommend lemon rice, a South Indian classic.) But the star of the menu is of course, the dosas, or savory rice and lentil crepes, which come with fillings like a masala potato mixture (the most classic option) to meatier fare like creamy butter chicken. No matter what you pick, both your stomach and wallet will leave full. Chef Niven Patel takes the concept of locally sourced produce to a whole new level at Ghee Indian Kitchen, his pair of Miami restaurants. He personally grows 15% of the produce he serves on his 2-acre property which is fondly dubbed Rancho Patel. But he is not just growing a handful of onions and a couple of barrels of potatoes: Patel raises mangos (for lassis and chutneys), alongside taro leaves, turmeric, and even Indian eggplant. The result is a highly seasonal menu of dishes like Rancho Patel vegetable poriyal (quick stir-fried vegetables) made with whatever produce is on hand, and Rancho Patel baby eggplant made with Yukon potatoes and heirloom tomatoes. This Texas city is home to one of the largest South Asian populations in the U.S., so it would only make sense that it also has some of the best Indian restaurants in the country. But if you only had time (or stomach space) to go to one, make it Himalaya. Chef Kaiser Lashkari serves up an extensive menu of Indian and Pakistani favorites like tender chicken kababs and fragrant biryanis. But the hidden gem on the menu is the hara masala -- a dish that features a verdant sauce made with green chillies, cilantro, yogurt, and plenty of garam masala. It arrives to the table bobbing with pieces of chicken (or paneer for the vegetarians). Lashkari is also a master of fusing local influences with his South Asian cooking, which means Himalaya also serves up a stellar quesadilla made with parathas and a tres leches topped with a thick drizzle of mango puree. At Philadelphia’s Indeblue, diners will find a fun mix of traditional but also more playful modern dishes. Sure you order bowls of creamy chicken makhani, mounds of fluffy saffron basmati rice, and buttery naan and be perfectly happy. But be sure to save room for dishes like the bbq pork samosa served with a tamarind bbq sauce, or the sali boti poutine that features spiced masala fries topped with yes, cheese curds, but also marinated and shredded lamb. Even brunch gets kicked up a few notches with dishes like the spicy chicken 'n waffle and the vindaloo egg skillet, which comes with “desi” or Indian-style home fries. There’s the Indian food your order to scarf down while binge watching Bollywood movies on Netflix, and then there is Junoon. 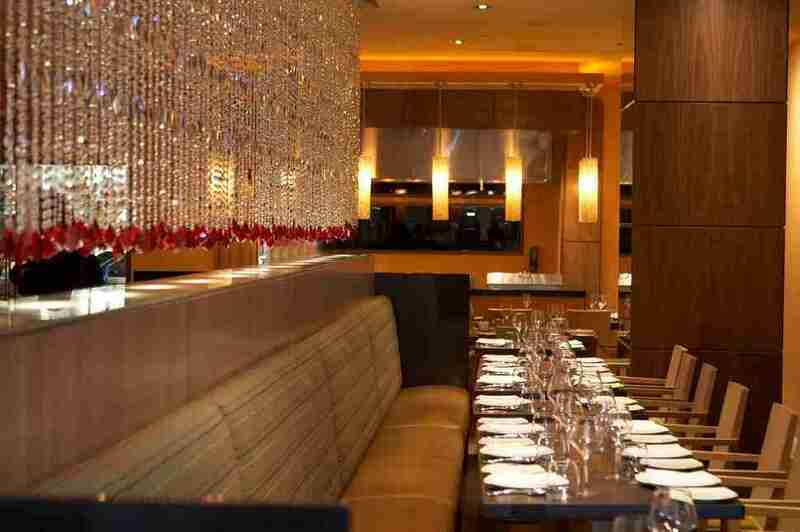 Located in New York City, Junoon is synonymous with modern Indian fine dining, so maybe leave the sweatpants at home. While ordering the tasting menu isn’t required, it’s hard to pass up the chance to eat uttapam, a rice and lentil pancake, topped with coconut chutney and caviar, portobello mushrooms over mashed masala potatoes with black truffle, and tandoori poussin, made with kale and a saffron aioli all in one sitting. 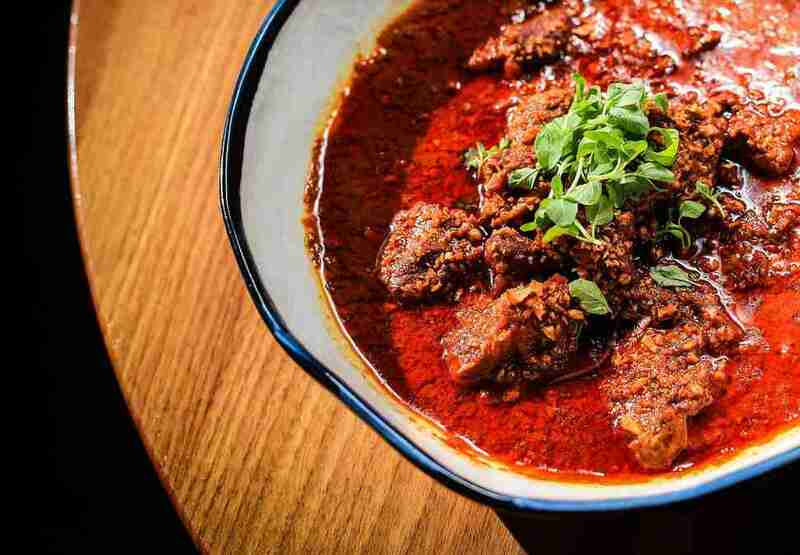 But if tasting menus aren’t your thing, the a la carte menu has dishes inspired by different regions of india including a plate of smoked pork ribs rubbed in vindaloo spices and a ghost chili murgh tikka that will set your mouth on fire. Neehee’s is the perfect place for people who like options. Located a short drive from the Detroit airport, the restaurant has an expansive menu of Indian street food and South Indian classics. Everything here is vegetarian, but you definitely won’t miss the meat. Pick up one of the sandwiches like the Samosa Pav, which layers a crispy fried samosa, chutney, and crushed peanuts between two grilled buns for a carb-bomb that will put a satisfied smile on anyone’s face. Or grab an order of the paneer pakoda, which are deep-fried squares of paneer coated in a chickpea flour batter and served with both mint and tamarind chutney for dipping. Even the kid’s menu here is incredibly fun: Little ones can pick between orders of dishes like jam and cheese dosas or deep-fried paneer burgers. It’s impossible to get bored here. Santa Fe is the land of green chiles; you can find them on everything including omelets, burgers, and yes, even Indian food. 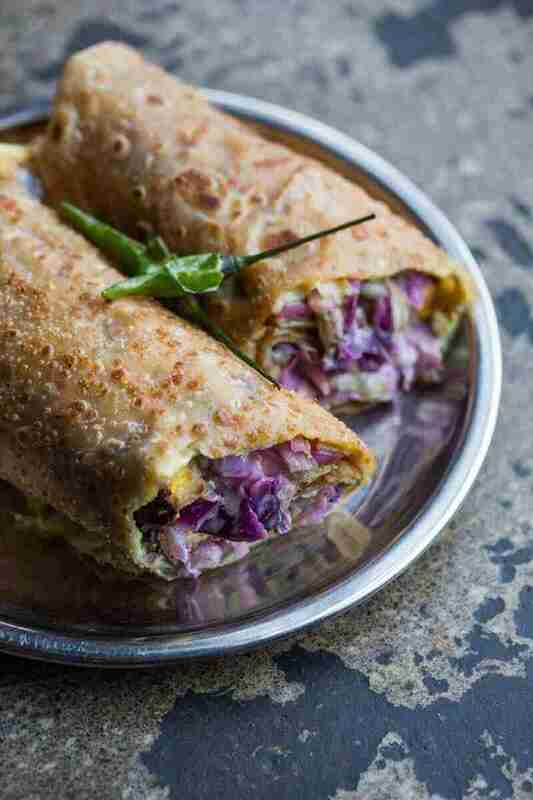 Paper Dosa specializes in, well, its namesake dosa, or crepe made from a fermented batter, which arrives stuffed with ingredients like spiced paneer and peas, white truffle oil, spiced ground lamb, or green chile and not one, but three cheeses. While the restaurant, which started out as a pop-up, has “dosa” in the name, don’t sleep on the other menu items like its uttapam, a light and fluffy savory pancake made from a fermented rice and lentil batter, or the dahi vada, a lentil fritter that arrives blanketed in yogurt and a spiderweb of tamarind and mint chutney. 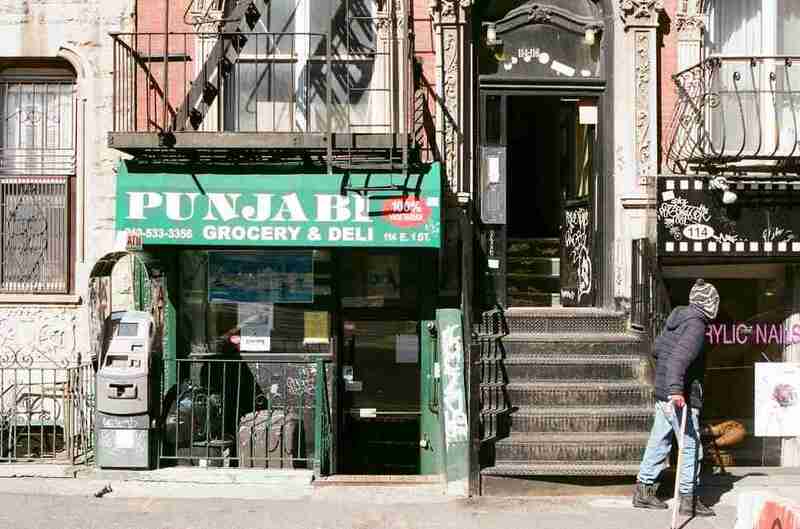 This tiny East Village restaurant is a popular stop for many of New York City’s cab drivers. It’s because they serve affordable and filling vegetarian meals for just a few dollars. The space is narrow and is frequently filled by hungry men impatiently waiting for their bowls of homestyle favorites like chole, spiced chickpeas in a tomato stew, and thick dal, to heat up. The real move here is to order whatever veg they have cooked up that day with some rice for just under $5. But don’t expect any fancy plates -- everything here is served in takeout containers to go. President Obama celebrated not just one birthday, but two birthdays at this legendary DC Indian restaurant. If that isn’t enough proof that Rasika should be on your personal restaurant bucket list, here are a few more facts to consider: It is helmed by James Beard Award-winning chef Vikram Sunderam, it has been open for 13 years (which is approximately 100 in restaurant years), and people love it so much, there are now two locations. 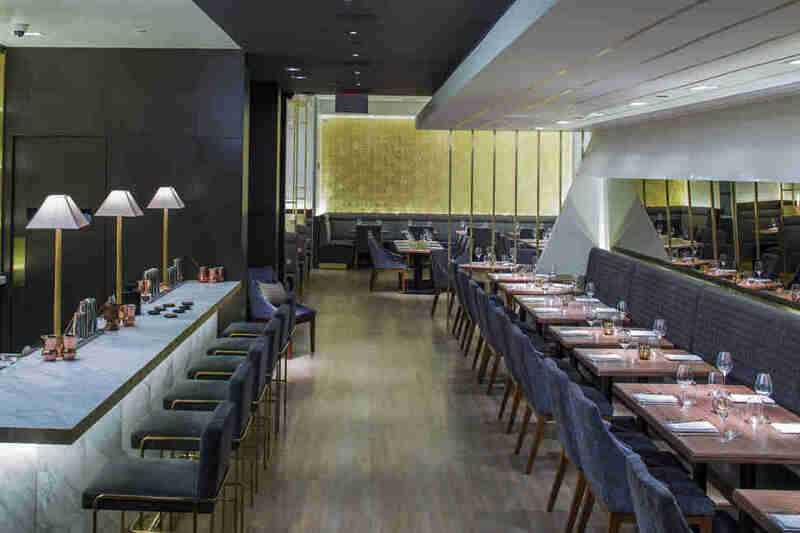 And if that isn’t enough to convince you to eat there, just consider that the menu includes playful modern takes on Indian standards like crispy sweet potato samosas, avocado chaat, and truffle naan. Saravanaa Bhavan is likely the largest chain of Indian restaurants in the world. 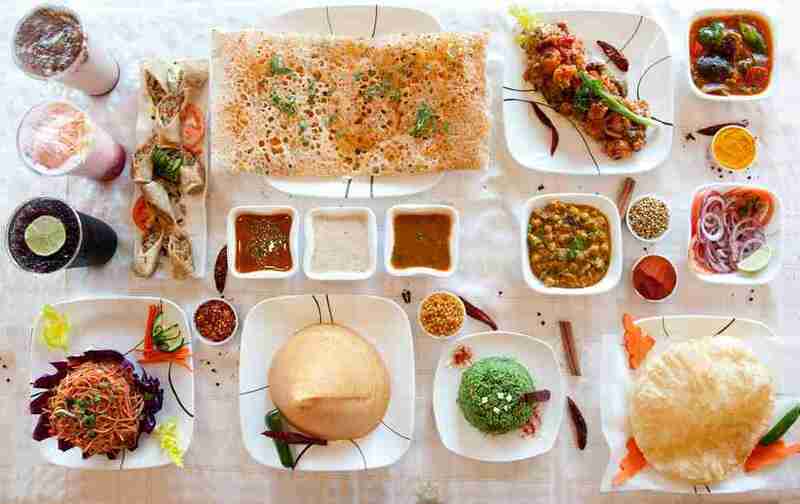 Founded in 1981, it has brought vegetarian South Indian food to the world. There are 33 locations within India and nearly 50 outposts in cities around the globe like New York, London, and Paris. It should be noted that founder P. Rajagopal has a complicated history with the law, but that hasn’t stopped the chain from churning out excellent dosas, idli (steamed pillows of rice batter), and vada (savory lentil donuts) for many decades. It’s best to go with a group so that you can order multiple dosas given all the filing options available. Why only eat a masala dosa filled with spiced potatoes, when you can also get one filled with cheese and onions, dry nuts & raisins, or paneer? You deserve to have them all. Ask any Indian in Los Angeles about where to go for Indian food and they will likely point you towards Surati Farsan Mart. The vegetarian restaurant, located in the bustling neighborhood of Artesia, is located in close proximity to a dozen other Indian restaurants, sweet shops, and jewelry stores. The restaurant is really two shops in one. First up, you can get the namesake farsan, which loosely translates to snack foods. You can order savory snacks like chakri, deep-fried spiral of spiced rice flour, and sweets like mango barfi, a fudge-like dessert, by the pound. 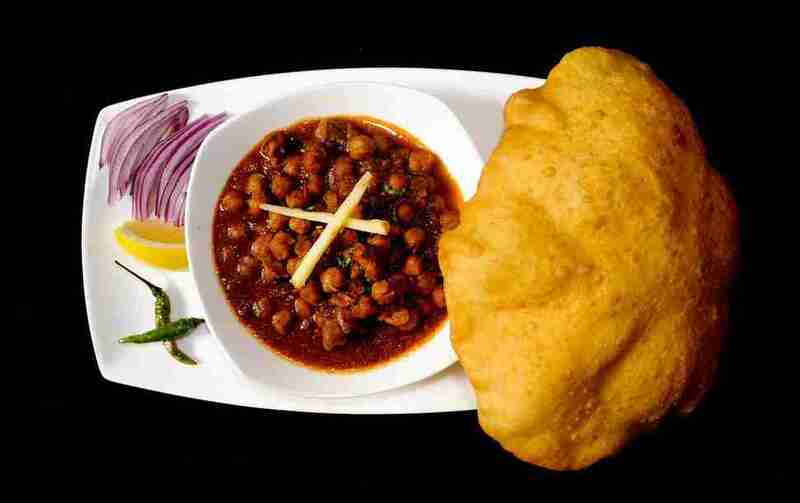 But you can also place an order from its insanely affordable (most things are sub $10) menu of hot dishes including plates of bataka vada, or fried mashed potatoes, and chole puri, or spiced chickpeas with puffy bread. For those looking for novelty, don’t skip the chocolate dosa, a sweet take on the popular lentil-and-rice crepe that surprisingly works. Not only is this one of the best Indian restaurants in the country, Tiffin Asha is one of the best restaurants in the country. Period. Spouses Sheila Bommakanti and Elizabeth Golay plate up South Indian favorites like dosas, and vadas, an addictive savory donut. 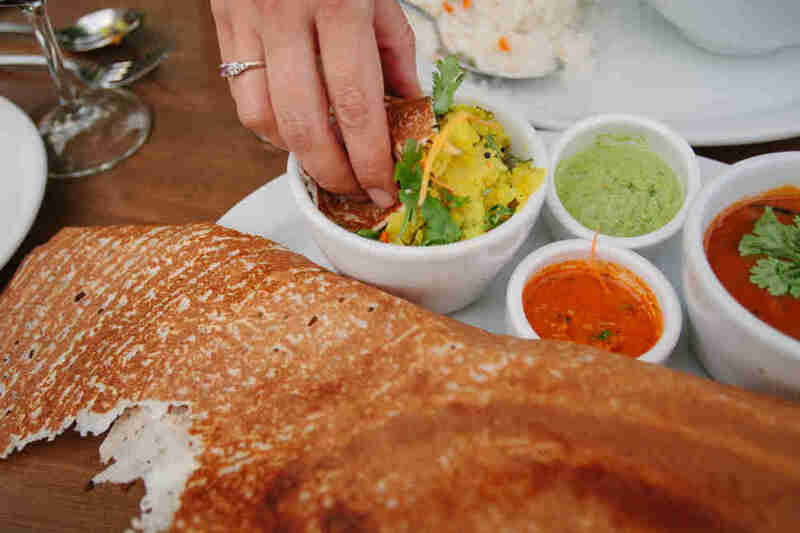 The dosas -- a house specialty -- come filled with traditional ingredients like spiced potatoes but also more playful fillings like blue cheese, honey, and fried chicken. Everything is best dipped in one of the many gunpowder chutneys which are made in-house from dry spices. They are explosive -- but only in flavor. Chaat means “to lick” but it also means street food dishes, which is exactly what the menu at Vik’s Chaat Corner is mainly comprised of. While you can order roti, daal, and South Indian favorites like dosa and uttapam, skip them in favor of the stars of the menu. 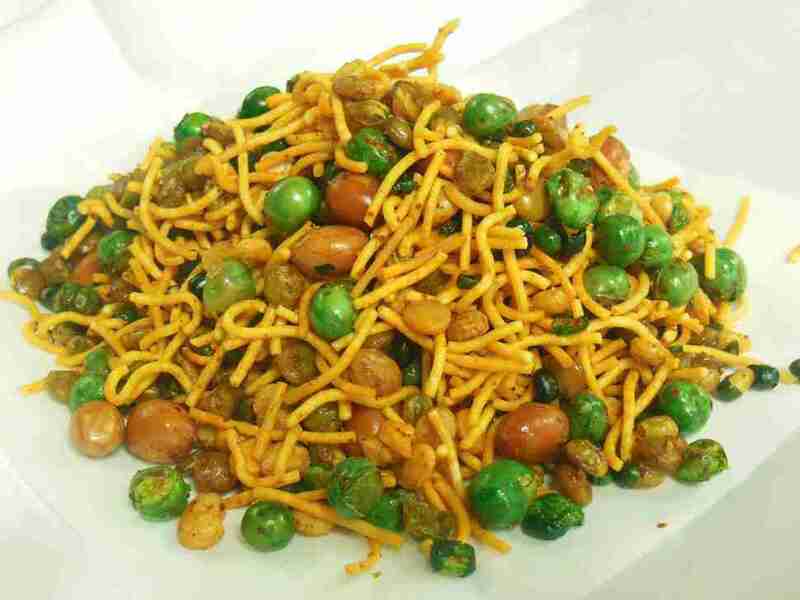 If you like crispy, crunchy, flavorful things then chaat is for you. Vik’s serves everything from aloo tikki, or tiny griddled potato patties topped with chickpeas and various chutneys to pani puri, a beloved dish where tiny fried puris are filled with potatoes, beans, and chutney, and dunked in a spicy herbaceous water (aka the pani). Khushbu Shah is a senior food editor at Thrillist and would eat a samosa every day in her dream life. Follow her @khushandoj.